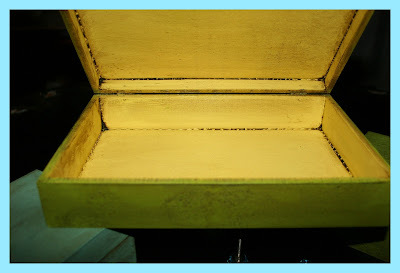 Dimples & Dragonflies Studio & Gallery LLC: "Studio Sneak Peek Friday"
Much To My Husband's Chagrin, I've Been Visiting His Woodshop Again! 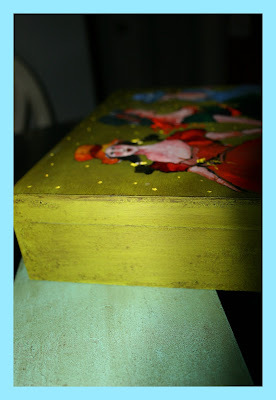 :)) Exploring Something New And Fun..I'm Experimenting With These Precious Wooden Boxes. All Are Different Sizes And Shapes, And It's Exciting To Try And Come Up With Compositions That Would Play Out Nicely On Their Surfaces. First I Gave Them All A Good Cleaning, Painted And Stained Them Inside And Out. This Is The Inside Of The Larger One I've Been Working On This Week. This Particular Box Isn't As Deep As The Smaller Ones. It's Longer And I Think It Would Be Perfect To House A Child's Bible Or Private Keepsakes. I'm Thinking Of Introducing These Pieces As "PRAYER BOXES" Because The Entire Time I've Been Working On Them, My Spirit Just Kept Returning To This Title. 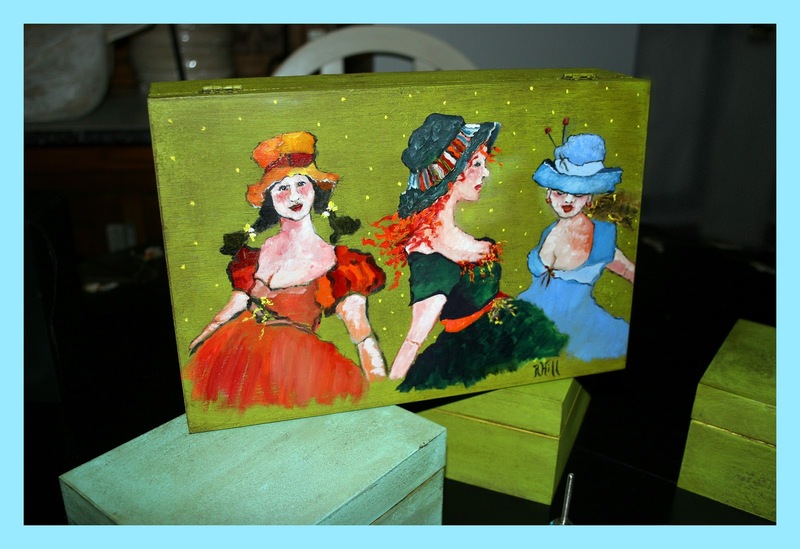 They Would Also Function Nicely As A "Valentine's Box" To Hold All The Sweet Cards A Child Collects On That Special Day! 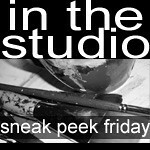 I'm So Happy Jennifer's Delightful Studio Sneak Peek Friday's Are Up And Running Again. Thank Anyone Who May Have Popped Over For A Visit Today! It's Fun To Celebrate Our Creative Processes..Our Accomplishments..And Best Of All, Ourselves. Oh Terri, that box is amazing! I adore your "ladies" as I call them in my head, whenever I see them - I think those 3 are just perfect on the box!!! Oh my gosh,how beautiful this box is. I can clearly see someone stashing all their precious Valentine treasures with the wooden boundaries. How beautiful it is. It looks as though they are sharing secrets the three of them. Best friends forever and ever. I love the little lady in the blue. She stole my heart right from the box top. Hope you are warm. It is cold here this morning. I woke up to 29 degrees and that is mighty cold for the desert. They say we are supposed to get back up into the 70s by the weekend. Come on heat. Would someone please pay the darn bill around here? Hi Terri! Glad to see you this week! 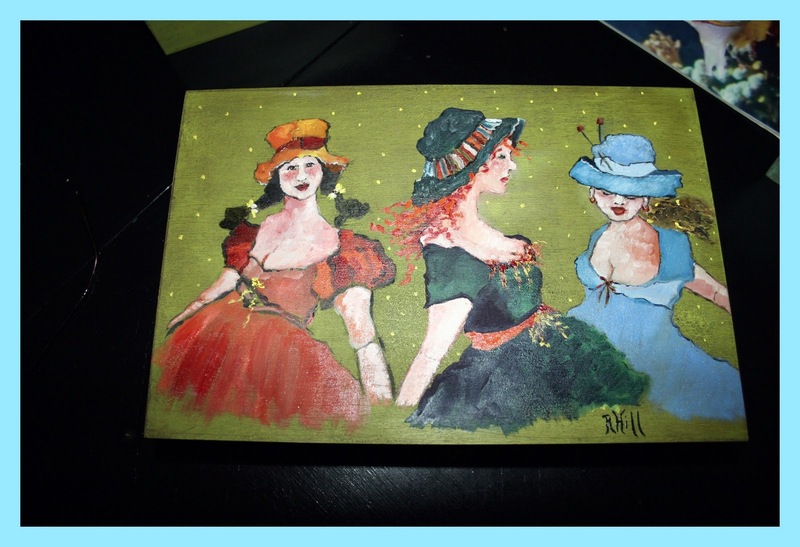 I do love your twirling ladies, as I loved your twirling girl from the end of last year...Hope you are staying warm - the ice storm is really keeping us indoors here in Texas! Terri, the beautiful ladies are so wonderful! Beholding them lifts my spirit!! You are amazingly creative in the ways you apply your art. I never fail to be inspired when I visit your place. Thank you. Thank you. Thank you. 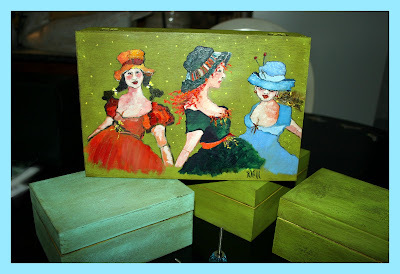 I'm loving your little box ideas, so much love is put into them, they are great for storing all sorts of treasures. Let's see, the little ones could hold lipsticks of all sorts. I find I collect them and always need a place to hold them all together so I can change the color out to match my outfit. And since this is the month of love, love letters would be another wonderful idea for them! Have a creative weekend my sweet friend. I'm looking forward to lots of studio time! I like this idea. I'm picturing one with shells on it to hold treasures frome the sea...flowers for pressed memories. You could go many ways with this. Congrats on the show and I love the boxes, the stain colors pop and sing of spring ... have a great weekend! Artist Terri ~ a visit to your blog always makes me smile! I love your idea of making the "prayer boxes"! Just wonderful. It is good to celebrate and share our creative processes, isn't it? It sure pays to listen to the little voice. Have a great week and Hugs!!! This is one of my favorite things of yours. Great use of a box and I can see the little lamb for kids on one. The ladies are just lovely, too. I just painted an old frame and then waxed it with butchers wax after. It feels nice and smooth again, like from the factory. Just thought I'd share. Keep painting, my friend. I have no words... Amazing boxes! Your work is so precious:)Thank you! 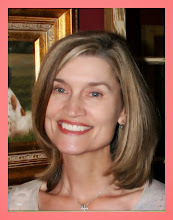 Terri- so fun to read your blog. I love your cheerful, inspiring posts. Beautiful prayer boxes.Nice to meet you!